UNIX architecture consists of following features as mentioned below. Hardware: This refers to the Hardware layer of any system. Kernel: It is the heart of the operating system and acts as an interface between user and hardware.It also performs the tasks like memory management, file management,scheduling, power management etc. Shell: This acts as an interface between user and the kernel. When user types in the terminal , shell interprets the command and calls the program that user wants. It uses the standard syntax for all commands. There are various kind of commands like C Shell, Bourne Shell and Korn Shell etc. Commands: There are different kind of commands which are used in day to day life. cp,cat,grep and ls are commands which are used to perform operations on UNIX. There are more than 250 commands along with some 3rd party commands. User: communicates with Shell through Commands. Files and Directories: In UNIX, all the data is organized into files. All files are organized into directories. These directories are organized into a tree-like structure called the file system. As mentioned before, user interacts with shell by using commands where shell translates them for kernel to understand. 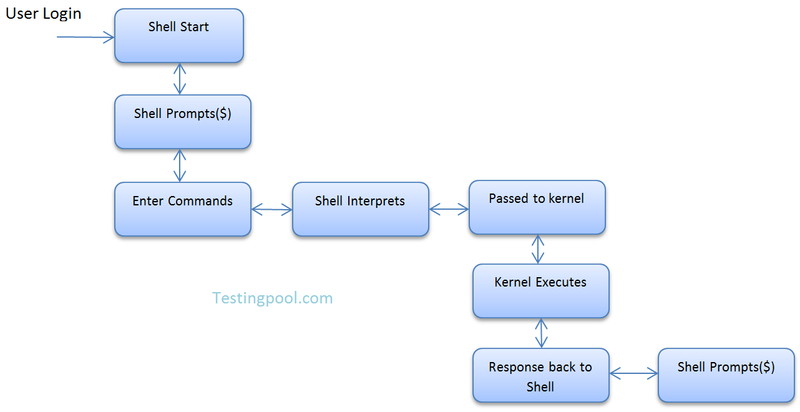 Kernel processes the results and send back if any response is available to shell.The shell finally displays a prompt back to the user.